The restart of the Tolko OSB mill in Slave Lake, Alberta—with accompanying capital investments and job creation—comes as good news for the community, which was hit by a devastating fire two years ago. 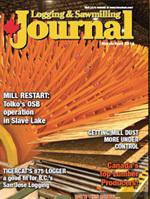 Read all about the mill re-start beginning on page 58 of this issue of Logging and Sawmilling Journal. (Photo of Tolko Slave Lake OSB operation by Tony Kryzanowski). An Alberta co-op—EDFOR Co-operative Ltd—could be a business model for smaller logging and sawmilling businesses, through which they can acquire a guaranteed wood supply. The first Tigercat 875 logger designed for loading or processing—a heavy duty purpose built machine with the features of the popular Tigercat 880 but in a smaller, energy efficient and ergonomic package—is a solid fit for B.C. contractor San Jose Logging. 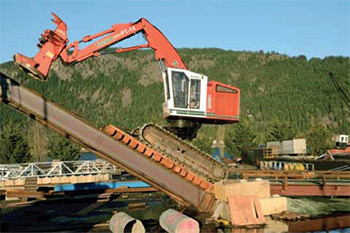 B.C.’s family-run Lime Creek Logging has a track record of working with innovative equipment in the woods—these days, that includes a Delimbinator, to handle small limby timber, and a Southstar processor head. See who’s on top, and what positions have changed, in Logging and Sawmilling Journal’s authoritative listing of the Top Lumber Producers in Canada, courtesy of leading forest industry consultants, International WOOD Markets Group Inc.
A mid-sized B.C. Interior sawmill, Woodco Management, is finding solid success producing wooden mats and mat components for Alberta’s oil patch, using a Micromill system and a new Select band saw. New filing equipment and getting more people into the trade will be the hot topics at this year’s B.C. Saw Filer’s Trade Show and Conference. Where is the supply for increased SPF lumber going to come from? It’s simple, say consultants Jim Girvan and Murray Hall. It’s could come from Alberta. Included in The Edge, Canada’s leading publication on research in the forest industry, are stories from the Canadian Wood Fibre Centre, Alberta Innovates - Bio Solutions, FPInnovations, NRCan and the Woodland Operations Learning Foundation (WOLF) and Alberta Agriculture and Rural Development. Getting mill dust more under controlA trial at a West Fraser sawmill in B.C. has demonstrated the feasibility and energy efficiency—and potentially increased safety—of using dust control equipment that has been very successfully used in the mining industry. A History of Forestry in Canada, which tells the story of the Canadian forest industry, was launched in early February, during PaperWeek Canada 2014 in Montreal. FPInnovations and Natural Resources Canada, and author Gilbert Paillé—forest engineer, former associate deputy minister, former president and CEO of the Forest Engineering Research Institute of Canada (FERIC)—officially launched A History of Forestry in Canada. The book celebrates both the importance and the history of Canadian forestry. A History of Forestry in Canada provides a detailed chronology of the main events that marked the Canadian forestry industry over the last 150 years. Among other things, the book talks about forest management philosophies, national forest strategies, management of public forests and private woodlots, and domestic and international wood trade. A History of Forestry in Canada is an essential tool for people interested in learning more about the vital role played by wood and forests in the economic development of Canada. Given that 54 per cent of Canada’s land area is covered in forest, it is no wonder that forestry has long been a major industry in the country. Forest products contribute one-fifth of the nation’s exports. Dr. Paillé is certainly an authority on the Canadian forest industry. He is a forest engineer who gra duated from Université Laval (1965) and the University of British Columbia (1970). Dr. Paillé was a resident engineer at Forêt Montmorency, a professor of forestry at Université Laval, a consulting engineer at Blais-McNeil in Québec City, the director of forest research at the Canadian International Paper Company in Montréal, the regional director of the Canadian Forest Service for the province of Québec, an associate deputy minister at the Ministère des Ressources naturelles et de la Faune, the Québec delegate to Scandinavia and the CEO of FERIC. 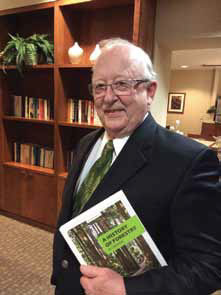 In addition to being the author of numerous scientific papers and technical reports, Dr. Paillé has also given some 100 lectures on forestry to a variety of audiences. He retired in 2005. A History of Forestry in Canada can be purchased for $42.95, plus applicable taxes and shipping, through FPInnovations’ website at publications.fpinnovations.ca. A History of Forestry in Canada, which tells the story of the Canadian forest industry, was launched in early February, during PaperWeek Canada 2014 in Montreal. 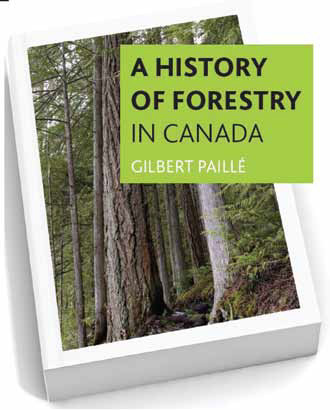 Its author is Gilbert Paillé, forest engineer, former associate deputy minister, and former president and CEO of the Forest Engineering Research Institute of Canada (FERIC). Technology and safety can go hand in hand in research. 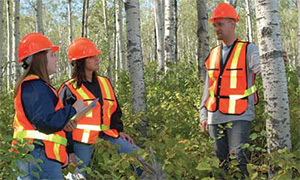 Today’s forestry workers are tasked to harvest trees on many different terrain types. While hand falling trees is one of the most dangerous jobs in the forest, the protection afforded by the cab of a feller buncher can minimize worker injuries and fatalities. FPInnovations is working to increase worker safety by performing machine tests that will help the industry better understand the safe working limits of this equipment on slopes. FPInnovations recently completed a contract for WorkSafeBC to develop a machine testing protocol and has completed the protocol’s initial validation. A tilt table was used to compare the stability characteristics of two different types of feller bunchers. The machines were placed on the table which was tilted to a maximum angle of forty degrees. Instrumentation allowed researchers to collect data about the machines’ weight transfer on a range of slopes and in a variety of machine positions. This will provide new information about the factors that affect machine stability. The results from FPInnovations will help forest companies, safety regulators, and equipment manufacturers improve the design and application of forest machines on slopes. This will increase worker safety and could ultimately extend the safe working limits for machines on slopes. 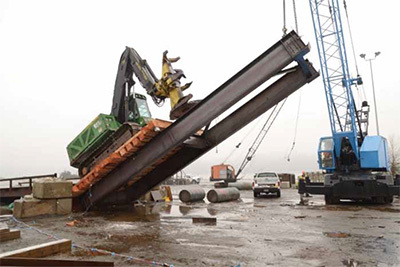 Co-operating on the project were Copcan Contracting, TimberWest, and Pacific Industrial Marine. In 2007 we had an ‘Aha!’ moment; we were involved in the development of several large run-of-river energy projects across coastal B.C. and this is where we first experienced the power of LiDAR. Immediately, we understood that this technology would be a ‘game changer’ for forestland planning and development; we were inspired to learn as much as we could to pioneer its application in our sector. Our company, Strategic Natural Resource Consultants, has invested seven years of effort and learning to get to a point today where our clients and partners are not only intrigued by the power of LiDAR—but are seeing it positively affect their bottom line and influence the business planning of forest management. Planning a 15 km mainline and 200 ha of harvesting on a remote island off BC’s north coast—from the office. Imagine sending crews to this rugged and remote location, so they are able to verify the site conditions and, with minimal modifications, execute the plan safely, properly and quickly. Imagine completing this project in several fewer shifts than would normally be required, saving tens of thousands of dollars in development costs and more than paying for the initial cost of LiDAR acquisition. We did this! Being able to develop an existing condition report for a 55 km mainline that is 1000 km away and then provide detailed design changes to that mainline—without any traditional surveying and only minimal site investigation. We did this! Going beyond a standard road construction release package which includes a typical plan and profile general arrangement design for a contractor to bid on—and instead providing a 3 dimensional visualization of what the final construction of the road design should look like reconciled directly back into the LiDAR based digital terrain model. We did this! LiDAR’s real value lies in how the data interacts with the forest; giving accurate representations of both the ground and the forest canopy structure. LiDAR gives the development planner the ability to see everything from a new and powerful perspective. It allows for a broad range of derivatives for use in development planning and modelling—both of the terrain and the forest structure itself. It can be used for everything from resource road design to enhanced forest inventories (EFI); from wildlife habitat modeling to hydrology analysis and much more. The main argument against aerial laser scanning (ALS) for forestry was, and often still is, the cost of the data acquisition. We have always believed that the value derived from this one dataset for forest management was significantly higher than any other form of remote sensing and that the cost of data acquisition could be quickly paid back if the technology was strategically applied. By creating an array of products to support analysis and inform decision-making throughout the forest management life-cycle, the value proposition of this technology has consistently outweighed its capital cost on every project we’ve undertaken. Our application of the technology has been driven from the ground up. We recognize that, at the end of the day, you can’t replace the experience, wisdom and judgment of a seasoned professional. However, you can apply this technology to really give that professional a huge advantage by giving them the very best available data in a format that allows them to analyze scenarios objectively, comprehensively and quickly. We have proven many times over that we can plan and cost developments from the office using ‘wall to wall’ coverage of high resolution and high accuracy terrain models. We have been successful at identifying and analyzing every possible development option to plan not just the current development, but future development as well. We have optimized road locations and married them to detailed cable yarding analysis to conduct harvest feasibility assessments before completing ground-truthing to confirm stand values and ground types. The Canadian Wood Fibre Centre (CWFC) is developing and evaluating mid-supply chain options for the harvesting and delivery of woody biomass in Canada. An important part of this work is the transfer of information to end-users through equipment demonstrations. As part of this, CWFC will demonstrate four proven woody biomass harvesting and collection systems at various locations across Canada in 2014. Demonstration attendees will witness the systems operating in both natural and afforestation stands. The objective is to achieve higher exposure for the various technologies with farmers, land managers, government officials and industry representatives as well as to demonstrate their advantages and disadvantages in a variety of applications and settings. This can include biomass recovery from commercial forest sites, fibre harvesting and collection on plantations, fibre management on oil and gas roads and leases, utility corridor fibre recovery, and for fibre reduction in such applications as Fire Smarting and mechanical thinning. Another objective is to show the different types of end products manufactured by each harvesting system because this could generate ideas among those attending the demonstrations on how these end products could possibly be applied within their own industries, such as possibly for environmental remediation in the oil and gas industry. In a forestry setting, the units are able to recover biomass from slash piles, blowdown sites, mechanical thinning applications, as well as areas infected by the mountain pine beetle and forest fires. The technologies that will be showcased are the Fecon Bio-Harvester pulling a trailer, the prototype Agriculture and Agri-Food Canada (AAFC) biomass harvester with a trailer, the Anderson Bio-Baler and the Gyro-Trac BBS harvesting and baling system. Three of the technologies are already commercially available and will work in either natural or afforestation sites while the AAFC prototype is geared toward afforestation sites. Keddy says all the systems are “add-ons” to existing equipment that landowners and managers are familiar with. 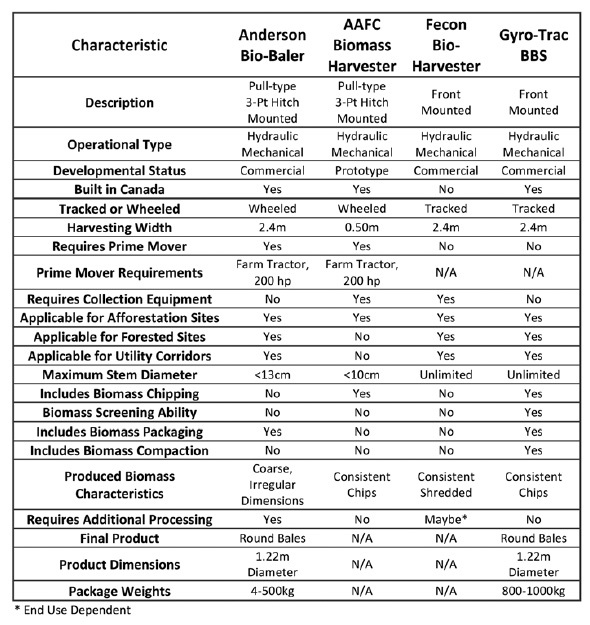 For example, both the Fecon and Gyro-Trac units are essentially mulcher prime movers with processing heads specially designed for fibre recovery, while both the Anderson Bio-Baler and AAFC units are implements that can be pulled behind a 200 horsepower farm tractor. In addition to giving greater exposure to the available technology, CWFC personnel will also use the demonstrations to evaluate the productivity and the cost of operations of using the various technologies in various harvesting and recovery scenarios. The demonstrations will start this spring and will continue at various locations across Canada throughout the year, with scheduling information posted in future issues of The Edge. For more information, contact CWFC Wood Fibre Development Specialist Tim Keddy at (780) 435-7212 or tkeddy@NRCan-RNCan.gc.ca or Derek Sidders at (780) 435-7355 or Derek.Sidders@NRCan-RNCan.gc.ca. The AAFC biomass harvester prototype is an implement pulled behind a tractor and is geared toward afforestation sites. It can process woody biomass up to 10 centimetres in diameter into chips that are blown into a trailer pulled behind the implement. The Fecon Bio-Harvester creates consistently shredded biomass from an unlimited diameter range of solid wood fibre, with the processed material blown like a snowblower into a trailer pulled by the Bio-Harvester. It can be used in both natural and afforestation settings. The Gyro-Trac BBS system can process solid wood fibre within an unlimited diameter range. It chips, screens and compacts the material into round bales that weigh about 1000 kilograms each. The Anderson Bio-Baler is an implement pulled behind a tractor that can process woody biomass up to 13 centimetres in diameter into coarse, irregular material that is converted into round bales. Each bale weighs between 250 and 500 kilograms. The European Union (EU) consumes about 85 per cent of the world’s wood pellets and about 30 per cent of that is supplied by Canada, amounting to almost $300 million in annual sales to the EU. 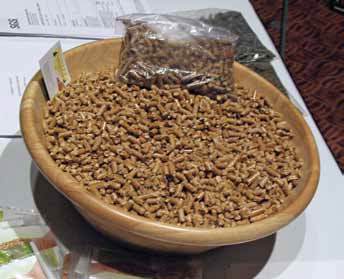 But until recently, Canada’s access to the European wood pellet market was in jeopardy. In 2012, the EU released new sustainability guidelines for solid biomass that may restrict biomass from “primary forests”, as defined by the United Nations Food and Agriculture Organization. Concerns arose that the EU may put many of Canada’s forests in this definition, without regard for the legislative and Sustainable Forest Management framework that exists to ensure sustainable forest practices within Canada. To help combat this potential trade barrier, Alberta Innovates Bio Solutions (AI Bio) decided to support the Canadian Institute of Forestry (CIF), which represents Canada on the International Energy Agency’s (IEA) Bioenergy Task 43 Initiative. This is where dialogue and knowledge exchange is taking place on the subject of management of biomass feedstocks for the energy market. AI Bio is contributing toward the $16,000 annual fee for CIF and its network of scientists to participate in and contribute to Task 43 events and activity. A recent outcome from Task 43 dialogue, likely to keep the important EU market open to Canadian wood pellet producers, demonstrates the value of this AI Bio investment. A workshop was hosted recently for Task Force 43 participants at Laval University to demonstrate Canadian forest practices and sustainability, and to discuss how different sustainability frameworks might interact to allow for international trade. The outcome of this field tour and workshop was to help European regulators understand the Canadian situation. It is now likely that when the EU sustainability criteria are released, they will be written in such a way that Canadians will be able to comply with existing practices. In other words, Canadian wood pellet producers—where the feedstock comes from a primary forest—will be able to continue to sell their products into the EU market. This outcome is important given how many tonnes of wood pellets that Europe consumes annually and that global consumption is expected to balloon by more than 300 percent by 2020, according to the industry consultants, International WOOD MARKETS Group. The IEA is a 28-member organization set up following the 1973 energy crisis, and it has proven invaluable as a platform for dialogue on such important issues as how countries develop policy around biomass feedstocks and their use in the energy market. Pineau says another event similar to the one hosted for IEA members in Laval will be held in Western Canada later in 2014, adding that CIF is well-suited to take on this extension and knowledge exchange role because of its research network of scientists working on forest sustainability issues in Canada. Alternatively, Canadian scientists also learn about how other countries harvest their woody biomass for use in bioenergy production as part of the information exchange at these events. Patrick Guidera, AI Bio Director of Forest Technology, says that AI Bio was impressed with the Canadian network that CIF has developed, which has resulted in a common voice around biomass feedstock management in Canada and their use in energy markets. “We’re hoping that the number of agencies across the country involved with CIF on Task 43 will improve the networking and the communication around this often complex question of how much biomass is out there, how much is it going to cost, and where is the market to send it to,” says Guidera. For more information about AI Bio support of CIF on the IEA Bioenergy Task 43 Initiative, contact Patrick Guidera at (780) 638-3722 or pat.guidera@albertainnovates.ca. Alberta’s population has grown by over one million people or 25 per cent since 2000. This amount of growth has created demand for landscaping materials such as trees and shrubs and represents a potential business opportunity for individuals interested in starting a tree nursery type of business. Cody Brown, General Manager at Tree to Tree Nurseries of Gleichen, Alberta agrees. “There’s a phenomenal amount of growth in the industry right now,” he says. “Alberta producers cannot grow enough material to meet market demand.” He says that nursery stock is being shipped in from areas surrounding the province, and even from as far as Minnesota. Brown learned about the tree nursery business while working with his father and grandfather on a nursery near Rimbey, and then earned a Bachelor’s degree in Environmental Studies from Lake Forest College, in Chicago. Because of his love for the outdoors, working with his hands, and desire to travel, establishing a nursery business in 2003 was a natural fit for him. While it was a good fit for him and his family, Brown says it’s not for everyone. The company markets both deciduous and coniferous trees with some native to the province, and other trees from outside the area but which have proven successful in this growing zone. 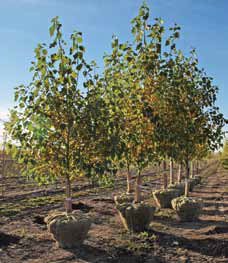 That includes paper birch, hawthorn, ash, Siberian larch, ornamental crab apple, hybrid poplar, aspen, cherry, mayday, and lilac—all common varieties seen throughout the province. They also grow conifers, especially spruce, pine and larch varieties. Brown says marketing, quality control, and starting with tree varieties native to Alberta are three priorities new entries to this industry should have. “You should start marketing the first day that you plant a tree,” he says. At present, the province has about 9,755 acres dedicated to tree nursery businesses. The total estimated value of this industry in annual sales in Alberta is about $77 million. Funding provided by Growing Forward 2 (GF2), a federal-provincial-territorial initiative, can help individuals and existing businesses investigate this option. Also, under the GF2 Business Management Skills Development Program, successful applicants are eligible for reimbursement for 75 per cent of eligible costs for approved business skills development training courses. Bozic says that those interested in starting a commercial tree nursery must have a strong dedication to this industry, be patient to reap the rewards, and be prepared for the hard work it takes to establish a viable business. He adds that they must possess great knowledge of growing a variety of tree species, which includes planting, pruning, fertilizing, watering, flowering, controlling weeds, identifying and treating tree insects and diseases, and dealing with various weather conditions such as wind, sudden storm, and cold. However, once established, a business can develop into a primary income and a legacy that can be passed on from one generation to the next. A good resource for starting in this endeavor is an organization called Landscape Alberta. “I believe that there is a lot of opportunity in this industry as lots of operators are getting on in age and are going to retire,” says Arnold Heuver, a former Alberta nursery manager and industry veteran who now consults to the industry as Arnold Heuver Consulting. “However, it takes a gutsy, aggressive, solid business-minded person to succeed in this business because it is very much a front-end loaded investment with little return for the first five years for a start-up,” he adds. For more information about the GF2 program, visit www.growingforward.alberta.ca or contact Toso Bozic at toso.bozic@gov.ab.ca. Ann Everatt, President and CEO of Alberta’s Northern Lakes College (NLC), expects a resurgence in Woodland Operations Learning Foundation (WOLF)-generated programming at the college, continuing a decade-long relationship that has provided residents of northern Alberta with relevant training for people that live and work in and around forestlands. Part of the reason for this optimism is because of WOLF’s expanded mandate beyond the forestry sector. WOLF now develops curriculum for those seeking employment or those currently employed, likely to leave a footprint on forested land. The training developed is based on feedback received from industry, its education partners as well as relationships with organizations like Alberta’s Colleges of Alberta Professional Foresters and Professional Forest Technologists. For example, this summer WOLF will present a series of courses geared toward environmental services, covering such topics as forest soils, eco-site classification, reclamation, watercourse crossing construction, and the environmental approvals process. These appeal to existing or potential resource industry employees. WOLF has provided over 10,000 student days of training since its incorporation in 2001. It has an agreement with NLC that allows the college to integrate the curriculum into its programming. WOLF has similar agreements with the Alberta Distance Learning Centre for secondary schools in Alberta. Over the years, NLC has mentored WOLF in instructional practices, curriculum development and distribution, provided financial support, operational space, and has included forestry-related training in its programming. Everatt says that some of the advantages of WOLF’s partnership with NLC are higher levels of course relevance, coupled with quality assurance for curriculum. WOLF Executive Director David Blackmore says that NLC’s support has been invaluable because of its experience with various types of educational delivery systems and techniques that appeal to a variety of learners, whether it is through traditional distance learning, online, or direct instruction. The support from NLC has enabled WOLF to provide effective, competency-based adult education matched to the most current information on operational, environmental and business practices on forested lands. NLC is responsible for a large stewardship area with campuses in 26 communities within an 180,000 square kilometre area of northern Alberta. Community Education Councils in each community provide NLC with input on their particular training needs. WOLF President Robert Anderson says that the NLC-WOLF partnership is filling an important niche in pre-employment training and continuing education that responds to the wishes of many northern communities to provide local training, so that young people can find work without leaving home. A lot of the province’s resource activity is taking place right in their backyards, offering local people with the right skillsets with the potential to land good paying jobs. Everatt says that given NLC’s connection with communities, the college can respond quickly to requirements for pre-employment training and continuing education. In turn, the college has partnered with organizations like WOLF to assist with continuing education programming. Blackmore says the success of the programming offered by WOLF through outlets like NLC is reflected in how quickly courses fill up.